The Subcommittee on Water, Oceans, and Wildlife is responsible for overseeing the agencies that manage America’s water resources, hydropower development, and federal transmission lines. Democrats on the subcommittee are committed to managing, developing, and improving America’s water supply in an environmentally and economically sound manner. Democrats are also dedicated to developing our domestic energy resources by promoting affordable, environmentally-sustainable hydroelectricity. The Subcommittee is also charged with developing and overseeing the implementation of laws managing domestic and international fisheries and other marine resources. The United States has made great strides in making fisheries more economically and environmentally sustainable, as well as in protecting vulnerable ocean ecosystems and species like sharks, whales, and coral. Much remains to be done, however, particularly in light of the threats climate change poses to our oceans and coasts. 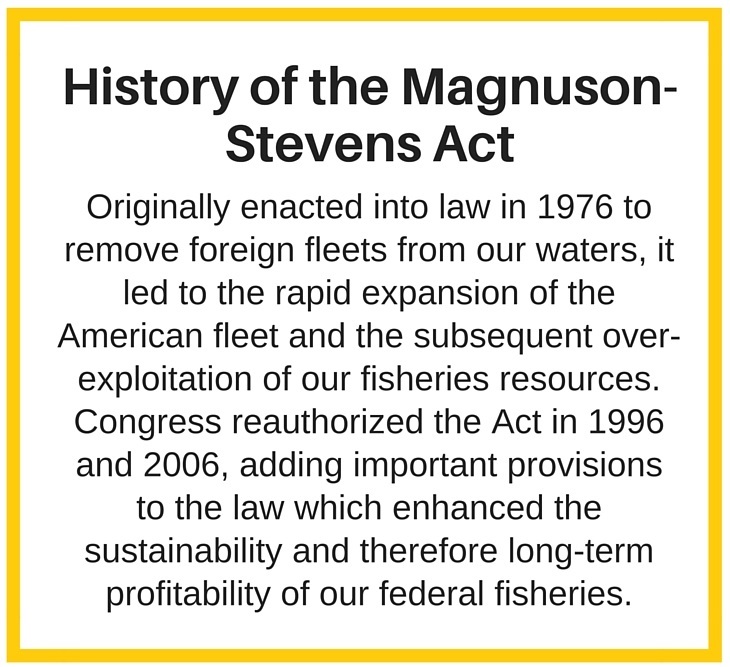 The Magnuson-Stevens Fishery Conservation and Management Act (also referred to as the Magnuson-Stevens Act or MSA) is the preeminent law governing the management and conservation of our fisheries in federal waters, which generally extend between 3 and 200 nautical miles offshore. Today, the United States has one of the best fisheries management systems in the world, used as a model for many other countries. A recent report by the National Oceanic and Atmospheric Administration (NOAA) shows that stocks of fish that are overfished or undergoing overfishing are at all-time lows. At the same time, the value of our fisheries is at a record high – sales of domestic seafood have exceeded $200m three years in a row, and recreational fisheries support nearly 400,000 jobs. Address existing gaps in our current law. While the National Standard Guidelines revisions can increase the flexibility of the management process, we believe that there are other issues that can only be adequately addressed legislatively. These include increasing the use of electronic monitoring, updating our data collection and storage infrastructure, recognizing artisanal fisheries, and encouraging more federal-state cooperative research and management programs. Develop bipartisan legislation to reauthorize the Magnuson-Stevens Act. 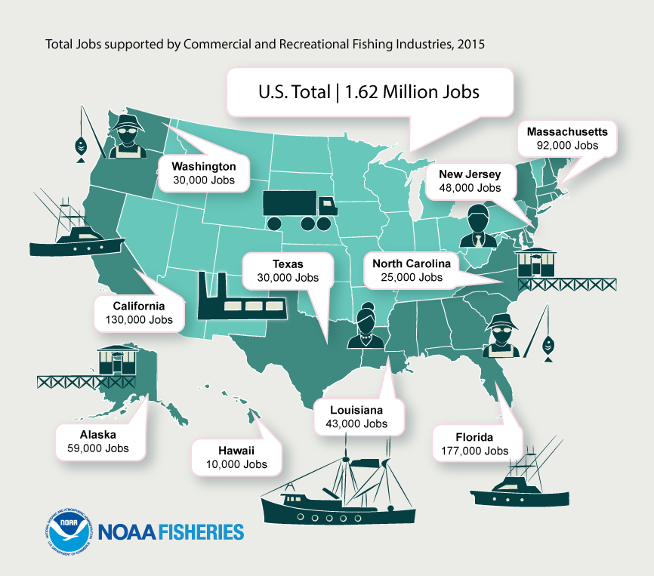 The importance of U.S. fisheries to our economy and food security cannot be overstated. The American people deserve a bipartisan re-authorization that does not threaten their livelihoods or their environment, and ensures a sustainable and profitable use of our fisheries resource. This can only be achieved through open discussions with all stakeholders, not a divisive bill that ignores the science and large portions of the fishing industry. We need common sense, proactive planning to reduce conflicts and increase safety on our seas. Due to its illegal and unreported nature, the economic and social costs of pirate fishing are difficult to define. However, it is estimated that the global value of illegal fish is $10 to $23.5 billion, representing between 11 and 26 million tons of fish. 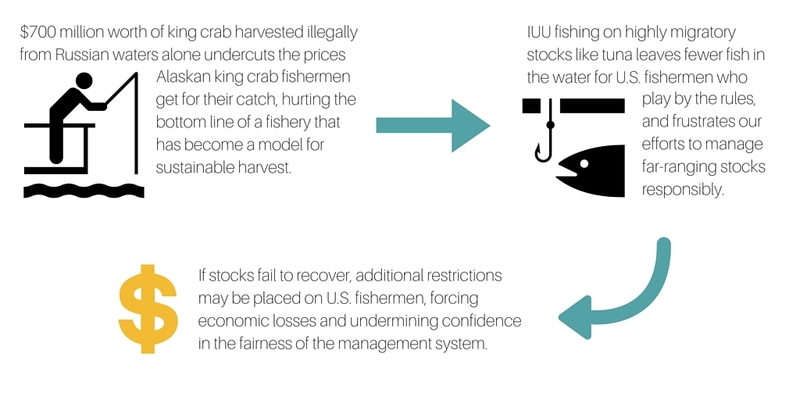 Not only does this kind of fishing harm marine ecosystems and deplete fish stocks around the world, it also causes significant economic harm to U.S. fishermen. To address these issues, Natural Resources Committee member Madeleine Bordallo (D-GU) introduced H.R. 774, the “Illegal, Unreported, and Unregulated Fishing Enforcement Act of 2015,” which was enacted into law. 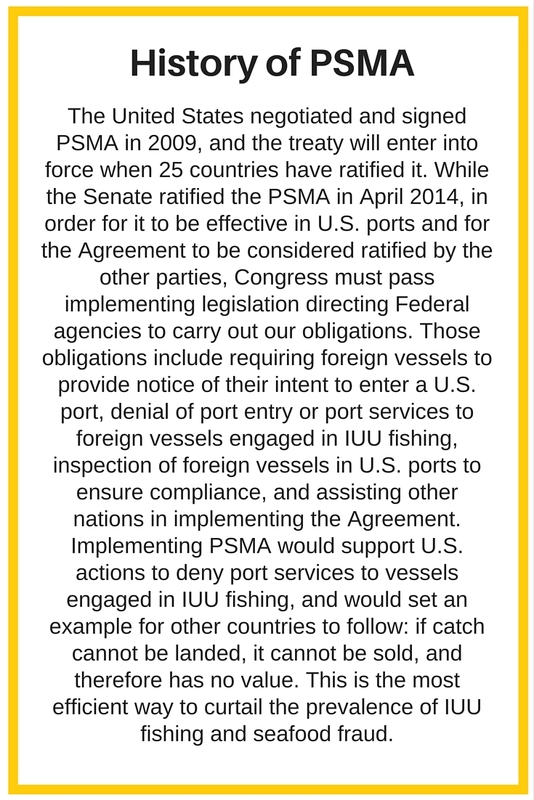 The law strengthens enforcement mechanisms to stop illegal, unreported, or unregulated (IUU) fishing and includes implementing legislation for the Agreement on Port State Measures to Prevent, Deter, and Eliminate Illegal, Unreported, and Unregulated Fishing (PSMA). Committee Democrats will continue to advocate for other efforts to combat pirate fishing. Global climate change is impacting every ecosystem on the planet, but oceans are particularly vulnerable to the effects of increased temperatures and atmospheric carbon dioxide concentrations. The earth has undeniably warmed since 1880, with most of this warming occurring since the 1970s, and 10 of the warmest years on record occurring in the past 12 years. The oceans have absorbed the majority of this excess heat with the top 2,000 feet of the ocean has warmed up by 0.302 degrees F since 1969. 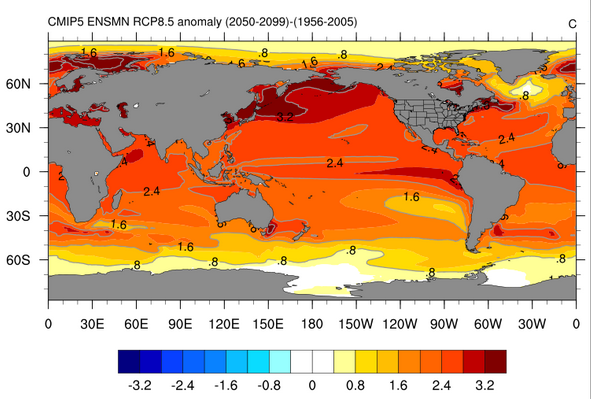 This warming is not taking place uniformly throughout the ocean. Instead, the northern hemisphere, particularly the Arctic and Subarctic regions, are changing much more rapidly. Changes in mean sea surface temperature for the latter half of the 21st century, as compared to the latter half of the 20th century. This map was created with NOAA’s Ocean Climate Change Portal. The change in ocean temperature, which has become a major factor in the drastic reduction of the extent and thickness of the Arctic sea ice over the last several decades. Similarly, the Antarctic ice shelf loss is mostly being caused by a warming ocean. The released carbon dioxide, which about a quarter gets absorbed by the oceans, mitigating the atmospheric effects (this is in addition to greenhouse gases increasing the temperature). The absorbed carbon dioxide changes the water chemistry of the ocean by reacting with water and carbonate ions to increase the acidity of the oceans, and remove carbonate ions from the water. Since the beginning of the industrial revolution, the acidity of the ocean has increased by 30%. In July 2017, Committee Democrats hosted a forum on the impacts of climate change on our oceans and coasts. Expert panelists from across the country presented evidence that global warming is already having massive impacts on marine and coastal ecosystems and the communities and businesses they support. Committee Democrats will continue to push for solutions to address these problems. Marine planning is a commonsense effort to look proactively at our coastal and ocean spaces and find ways that coordination and cooperation can reduce user conflict, protect the environment, and bolster the economy. Oceans and coasts produce the equivalent of $2.5 trillion a year, meaning that in terms of Gross Domestic Product, the marine environment is the world’s 7th largest economy. Despite countless Republican letters, hearings, and legislative riders designed to undercut the Policy, federal agencies have forged ahead to coordinate their ocean-related activities with the support of stakeholders from interest as varied as shipping, agriculture, aquaculture, conservation, renewable energy, and commercial and recreational fishing. It is clear that science-based coastal and ocean planning is – and should be – here to stay. House Republicans dogmatic and poorly reasoned opposition to the Policy shows a lack of respect for science and a lack of appreciation for the magnitude and complexity of the governance challenges we face. It seems some Members of Congress do not want to see government succeed, even when government fails to respond to a disaster, predict a drought, or properly manage a fishery can devastate the communities they represent. There was a time when Republicans and Democrats could at least agree on making government more efficient; now House Republicans have taken a Policy designed to reduce conflict and are using it as a tool to create more conflict. Conservatives always say they want to run government like a business. Well, would you invest in a business with different departments that don’t talk to each other? Would you invest in a business that isn’t responsive to its shareholders? Would you invest in a business with no business plan? That is essentially what the National Ocean Policy is: a business plan for the oceans that seeks to maximize the benefits for shareholders: the American people. The Policy is a win-win-win for economic growth, public safety, and environmental protection, and Natural Resources Democrats are fighting to keep it in place. Nearly 40% of the population of the United States lives along the coast, and the ocean provides jobs for over 2.3 million Americans. Six major industries, including tourism, mineral extraction, marine transportation, and fisheries generate more than $200 billion annually. This incredible economic engine is dependent on clean, resilient environments that can continue to provide us with resources. It is therefore imperative that we protect and restore our oceans and coasts from a changing climate, natural disasters, and human activities. We need to protect special ocean places. President Barack Obama, following the example of President George W. Bush before him, used the authority granted to him by Congress to create and expand marine national monuments under the Antiquities Act. These designations are backed by reams of scientific evidence and massive public support, yet the Trump Administration and its allies in Congress are trying to roll back these protections. Our oceans support multiple uses – from commercial fishing, to energy development, to recreational boating, angling SCUBA diving, and wildlife watching. However, just as is the case on land, it is wise to put some ocean areas off limits to extractive uses, especially areas that support unique or fragile species or habitats. Global warming continues to change our climate, the incidence of natural disasters is likely to increase. For example, sea level rise, led on by a warmer ocean and atmosphere, will make storm surges much more likely to cause damage and put people’s lives at risk. This issue can be addressed in two ways: reducing the extent of climate change by regulating human activities that are contributing to climate change, and making coastal communities more resilient so that they are better able to prepare for and respond to natural disasters. Increasing the resilience of coastal communities requires funds to be appropriated to federal agencies to build up the capacity of these communities. Unfortunately, coastal resilience is not being provided adequate funding by Republican appropriation bills. Equally important is having adequate monitoring and observing capabilities along our coasts to be able to predict and forecast natural disasters. This is accomplished by the Integrated Ocean Observing System (IOOS), a national-regional partnership administered by NOAA which has not been reauthorized by the Republican Congress. Human activities can directly impact the health of our coasts and oceans. With the amount of oil and gas extraction activity along our coasts, events like the BP Deepwater Horizon (DWH) oil spills are a constant possibility that we need to minimize and prepare for. Five years after DWH, we are still working to understand all the consequences of the spilled oil and applied dispersants. Moving forward, we need to apply stricter safety regulations while continuing our commitment to restore the areas of Louisiana, Mississippi, Texas, Alabama, and Florida affected by the spill. Nearly $700 million has been applied to 54 Gulf restoration projects, and although these projects are making great progress, it will likely take decades for the coastline and ecosystems to fully recover. The recent settlement between BP and the federal, state and local governments of $18.7 billion was the largest settlement in history for an environmental disaster, and although this is a step in the right direction, there is still a lot of work to be done. Other human activities, like marine aquaculture, provide direct benefits to the local community, as well as increase the national food production. Marine aquaculture is still a relatively small industry in the U.S. but should be encouraged to develop in a responsible and sustainable way, by minimizing the ecological footprint of the operation and eliminating its chemical or biological pollution. Natural Resources Committee Democrats continue to have a strong commitment to protecting and restoring our coasts and oceans. We advocate for responsible funding to coastal communities so that they can adequately predict and prepare for disasters and reduce the funding necessary to mitigate the impacts of disasters. In the oceans, an ounce of prevention is worth a ton of cure. We need to invest in our coastal ecosystems and infrastructure. According to the National Drought Mitigation Center, nearly 40% of the country is currently experiencing some kind of drought watch or warning and 14% of the country is experiencing severe drought or worse. The lack of rain, low storage in reservoirs, and low river flows – not environmental laws – are the major causes of low water supplies across the West. 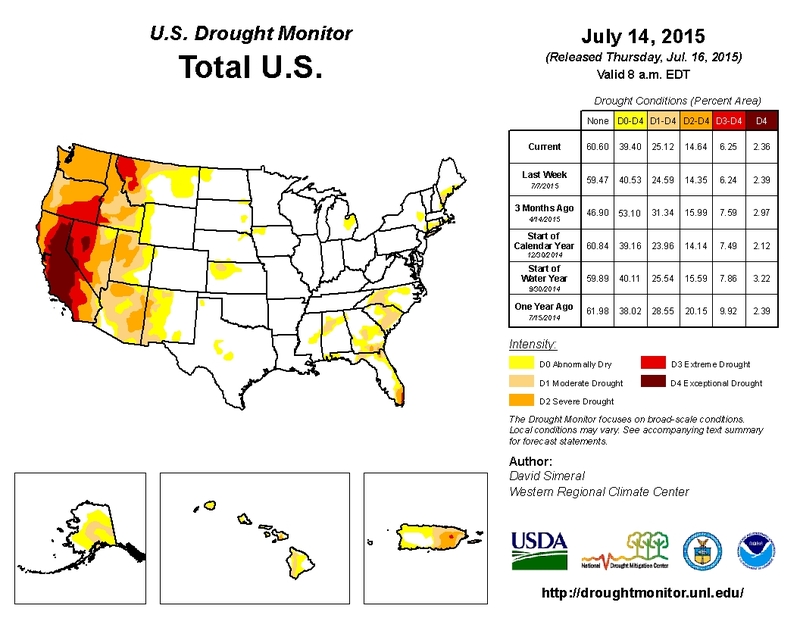 See the most current drought conditions here. Republican efforts to blame the drought in California and other Western states on bedrock environmental laws are not supported by the facts. Fact: Reductions in water pumping from California’s main water distribution hub – the Sacramento-San Joaquin River Delta – are primarily due to water quality protections that are necessary to make sure the water being pumped is not too salty to be used for agricultural irrigation or for drinking water supplies. For more information, view the California Water Boards 2015 report. Fact: Only 2% of the reduction in water supply statewide was caused by Endangered Species Act protections in 2014. Fact: Minimal protections have kept species nearing extinction on life support and also sustain non-endangered fish species that support thousands of jobs in numerous industries­. Republican claims that large amounts of water are being “wasted” on the environment are also clearly false. Minimal amounts of water are being devoted to maintaining important ecological functions of freshwater systems. In California, the State Water Resources Control Board has estimated that in 2014 only 4% of all the runoff in the Bay-Delta watershed flowed to San Francisco Bay solely for environmental protection and could otherwise have been captured, and in 2015, this amount went down to 2%. For example, Committee Democrats support investment in WaterSMART projects, which currently create 730,000 acre-feet of water per year. WaterSMART projects range from lining of irrigation canals to industrial efficiencies. For more information, view the U.S. Department of the Interior's WaterSMART page. Additionally, Title XVI water recycling projects created 378,000 acre-feet of water in 2014, or enough water to supply three million people for a year, according to the U.S. Bureau of Reclamation. Title XVI recycling projects should be supported and expanded. Committee Democrats support reasonable environmental protections to promote healthy river ecosystems that support Western state economies – including the Pacific Region's commercial and recreational fishing industry, which generates over $30 billion in sales per year, provides more than $7 billion in income, and sustains over 200,000 jobs, according to the National Oceanic and Atmospheric Administration. In fact, the last closure of the West Coast salmon fishery in 2008 and 2009 required $158 million in disaster relief from Congress. This proves that maintaining healthy rivers will support the economy and make future fishery disasters less likely. Committee Democrats support Indian water rights settlements and seek to expedite current water settlement negotiations between tribes and the federal government. 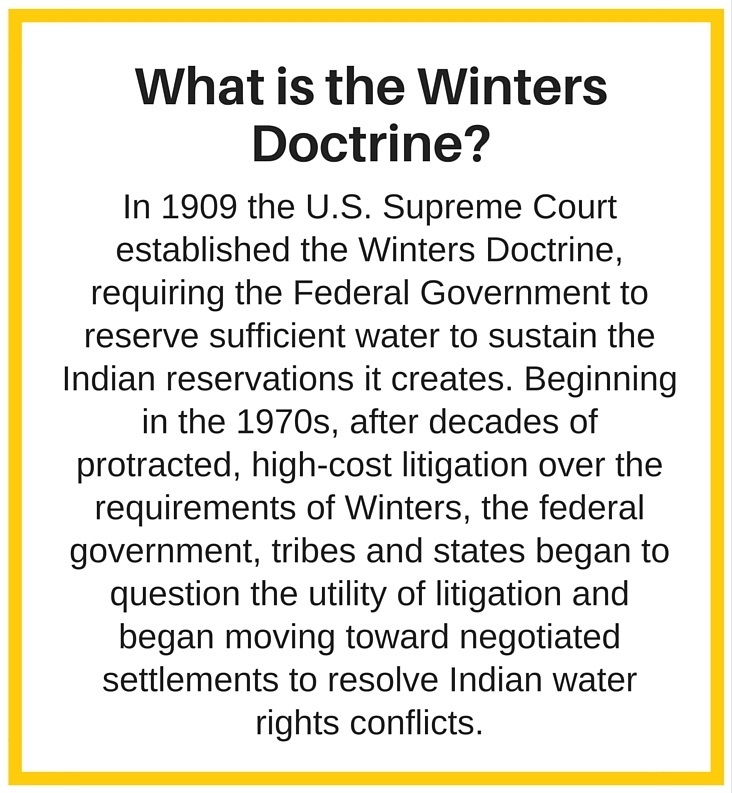 Indian Water Rights settlements provide water supply certainty for tribal and non-tribal communities and end expensive and protracted litigation. Congress has approved more than two dozen Indian water rights settlements since 1978, creating thousands of jobs and spurring economic development across Indian country and surrounding communities. For example, a few recent settlements in the Claims Resolution Act, the Navajo-San Juan settlement and the Arizona Water Settlement Act will sustain 1,600-2,200 jobs per year over the next decade. For more information, view the U.S. Bureau of Reclamation’s Testimony before Senate Committee on Indian Affairs delivered on March 15, 2012. Pending settlement negotiations should be completed and approved by Congress as soon as possible. Committee Democrats support hydropower development consistent with landmark environmental protections like the National Environmental Policy Act. We do not have to choose between protecting our environment and the production of hydropower. We can have both. Democrats have historically supported hydropower development and recently worked with Republicans to streamline hydropower development – passing the Small Conduit Hydropower Act and the Hydropower Regulatory Efficiency Act by a House vote of 416-7 and 422-0 respectively during the 113th Congress. Rehabbing our decades old facilities and aging infrastructure and the use of new hydropower technologies that are both efficient and environmentally friendly. According to a recent study, nearly 9,000 megawatts of new capacity could be added through modernizing existing hydropower facilities. Western Area Power Administration’s use of borrowing authority to finance transmission lines for grid reliability and to bring renewable energy to market. Western borrowing authority will also create thousands of jobs across the West. For example, a committee report states that one single project currently under development – the 725-mile TransWest Express transmission line – is projected to support roughly 18,000 jobs and deliver 3,000 megawatts of renewable energy from Wyoming to the Desert Southwest. The Bureau of Reclamation is the second largest producer of hydropower in the nation. According to a U.S. Department of the Interior report, reclamation’s 58 power plants annually provide more than 40 billion kilowatt hours, generating nearly a billion dollars in power revenues and producing enough electricity to serve 3.5 million homes. Hearing on "Federal Impediments to Commerce and Innovative Injurious Species Management"
On "The Weaponization of the National Environmental Policy Act and the Implications of Environmental Lawfare"